The Denisova Cave in Siberia’s Altai Mountains is known for being a unique place, where three different groups of humans lived in the last 100 K years: Denisovans, Neandertals and Modern Humans. A finger phalanx (Denisova 3) and a molar (Denisova 4) from that site were published in 2010. Fortunately the genetic materials were preserved, allowing the Max Planck Institute to analyse the DNA. They resulted to be a new species, cousin of the Neandertals, named the ‘Denisovans’. Both species share a common ancestor, which in turn shares a common ancestor with Homo sapiens. Moreover, 0.5% of the genome of Denisova 3 was derived from a Neandertal population, probably related to the Neandertals that lived in the Denisova Cave. Denisovans also interbred with some populations of Homo sapiens, contributing about 5% of the genome of some today’s Oceania people and 0.2% of the genome of Native Americans and main-land Asians. Denisova 3 was a young girl and Denisova 4 was an adult male. 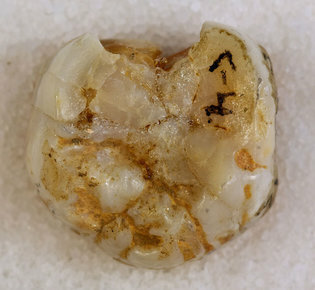 A second molar was found in 2010 – thought to belong to a cave bear given its size and huge, splayed roots. This was later reconsidered to be a human tooth. Its DNA was analysed by the Max Planck Institute and published in 2015. It turned out to be another adult male Denisovan specimen (Denisovan 8), the third Denisovan. What do we know about the Denisovan DNA? Nuclear DNA sequences from the two molars form a clade with the one of the finger phalanx. The three specimens were a single biological group. The mitocondrial DNA of Denisova 8 has accumulated fewer substitutions than the other two specimens. This means that he was present in the region aprox. 60 K years before the other two (c. 110 KYA). The Denisovans either occupied the region at least 110 to 50 KYA, or came into the region at least twice. The nuclear DNA sequence diversity among the three Denisovans is comparable to that among the Neandertals, but lower than that among today’s humans. The new genetic analysis shows less relationship to Neandertals than the analysis from 2010. Although the morphology of third molars is generally variable, both molars Denisova 4 and Denisova 8 are very large and lack traits typical of Neandertals and modern humans. The length of Denisova 8 is comparable to Pliocene hominins. Only two other Late Pleistocene third molars are comparable in size. The size of the two molars may suggest that large teeth is a Denisovan feature. 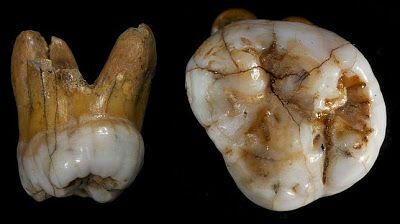 The Denisovan molars also have massively flaring roots and relatively large and complex crowns. They show similarities with the Xujiayao teeth recently described by Xing S., Martinón-Torres M. et al. Large teeth and massive roots are indicative of massive jaws. Could this be the first clue of the Denisovan morphology? As resulted from the 2010 DNA analysis, the Denisova 3 phalanx carries a component derived from an unknown hominin who diverged 1–4 MYA from the lineage leading to Neandertals, Denisovans and today’s humans. That hominin could be Homo erectus, or another ancestor we have not found any fossil yet. This new study has no clear output concerning this component, which seems to differ among the three Denisovan individuals. There was Denisovan introgression in the specimens from East and South Asia and Papuans. At least two distinct instances of Denisovan admixture into modern humans occurred. There is a much closer Denisovan match among Han Chinese, Chinese Dai, and Japanese DNA sequences. Esta entrada fue publicada en Actualidad y etiquetada Denisovanos. Guarda el enlace permanente. Has anyone considered the idea that maybe not only their jaw was big, maybe the denisovans themselves were giants. Every time I hear a story about human like species, I think of a special human like characters mentioned in two Hindu epic tails from two different time period- The ‘Monkey man’ or Hanuman. Hanuman was last of its kind who lived some 5000 years ago. Mahabharat is a tale from the same period. While the date for another epic Ramayana is not known, it is believed that it comes from a period at least couple of thousand years before Mahabharat. It also writes how a troop of monkey man who lived/ruled in the Jungle helped King Ram to fight devilish king Ravan who ruled present day Srilanka. Bali, in Indonosia, is the name after the very monkey king in the Hindu literature. However, in Indonesia they believe he was a man. Ever since Dwarika has been found underneath the sea in the Arabian sea (mentioned in Mahabharat) people believe that it could be testimony of a history that lived and not just a fixion. Could some species of these Tailed human lived along side us deep in the forest until very recent past ? FINALLY SOLVED : The human evolution must consider the evolution of intelligence, but after fifteen years I have found only “the evolution of emotions”. These two processes intersect at one point – baby / human infant that is incapable for independent survival for many years. That is not an evolutionary mistake, on the contrary, that is the key element. By observing his mother’s behavior, a process called MSP/multi self-projection passively occurs in baby’s brain when child perceives guardians body as his own. That way infant’s CNS immediately learns the shortest way to get something done which enables the creation of many more similar thinking processes till the moment when a minimal number of thinking processes are required in order to effect of self-consciousness arise.